Let me say this louder for the people in the back… CHILDREN ARE EXPENSIVE! Are you tired of spending a large amount of money on diapers or training pants for your little one? So I’m here to tell you guys to save your money, honey. I came up with a short list of the best affordable alternatives for diapers and training pants. To be honest, my favorite brand name of baby diapers is Huggies. However, I do not always have money to spend on huggies. Because reality, sis. I was unaware that babies were so expensive. I was going broke from getting things for The Mini Melanin Gawddess. Therefore, I do not always have the funds to afford huggies. One brand of diapers that I tried when I was… BROKE was the Target brand diapers, Up & Up Diapers. Up & Up diapers are great! It is affordable and it is good quality. Delicate straps – if you pull at the straps a little too hard, it would rip off. I rate this product a 8.5 out of 10 stars due to the strap situation that I have had. Overall, these diapers are the best inexpensive diapers that I have tried. You can pick yours up from the Target website. It is definitely a reasonable price, only $21.99 for a box of up & up giant diapers. You cannot go wrong with that one. This is ideal for the mama’s who do not or can not want to constantly run down to their local target. 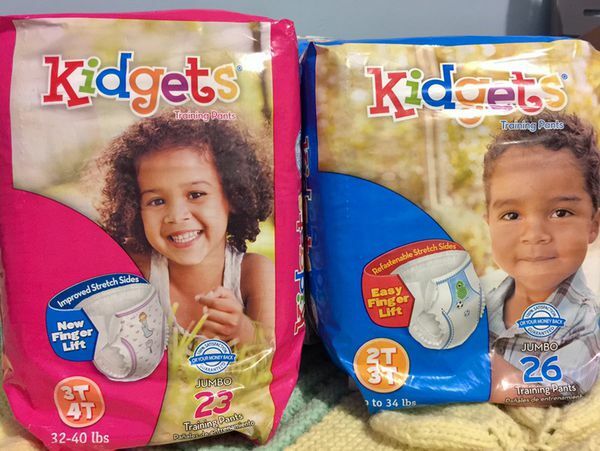 If your little one is in the potty training stage, you can try out these low costing brands when you are low on funds. It is not only a money saver, it may also have you questioning your future decisions. Wondering if you should continue buying popular name brand products or not. The first brand of affordable pull ups that I have tried was located at the local BJ’s. They had a box of Berkley Jensen Training Pants for only $24.99. Absorbent – Ideal for if your little is still not fully capable of using the potty routinely. I literally have nothing bad to say about the Berkley Jensen Training Pants. I give the Berkley Jensen Training Pants a 10 out of 10 stars. This was absolutely an amazing inexpensive alternative to the brand name Pull-ups training pants. I think that I will be sticking to these training pants for now on. Why spend $25.00-$30.00 for only 50 pairs of Pull-Ups brand training pants when you could spend $24.99 and get 86 pairs of training pants with the Berkley Jensen brand? Another good inexpensive alternative to Pull Ups training pants were the Family Dollar brand, Kidgets Training Pants. On Sunday, my significant other went to the local Family dollar. I asked him to bring back some training pants for The Mini Melanin Gawddess. Since the count was getting really low. He came home with a pack of Kidgets Training Pants for around $7.99 or $8.99. Bruh, before you even say it, you could already guess what I was thinking. I was thinking, what on earth am I going to do with these cheap ol’ training pants? Honey, I thought they were going to rip and I was expecting a cheaply made product. Why was I so skeptical and being a bitter-betty? Well… we have never tried them before and I am usually a Google guru. I would google reviews before I purchase an alternative product to avoid wasting money. However, to my surprise the Kidgets Training pants are actually decent. I have to honestly give this product a 8 out of 10 stars. Why? Due to the quality of the product and it actually shocking the Sugar, Honey, Iced Tea out of me. So babes, if my significant other does end up reading this post, I just want him to know that he did a good job by purchasing this product. Back massage and foot massage for you! These three alternatives are the best ones that I’ve tried and it has saved me a ton of money buying these instead. I hope that you guys have learned from my experience. Please remember that the most important things to look for when purchasing inexpensive alternatives for diapers or training pants for your little one is how absorbent the product is and how comfortable it will be. Please keep in mind that your child has to wear the product and you do not. Therefore, they deserve to be comfortable and dry. If you love this post, you’d love my next one. Stop what you’re doing and subscribe today!